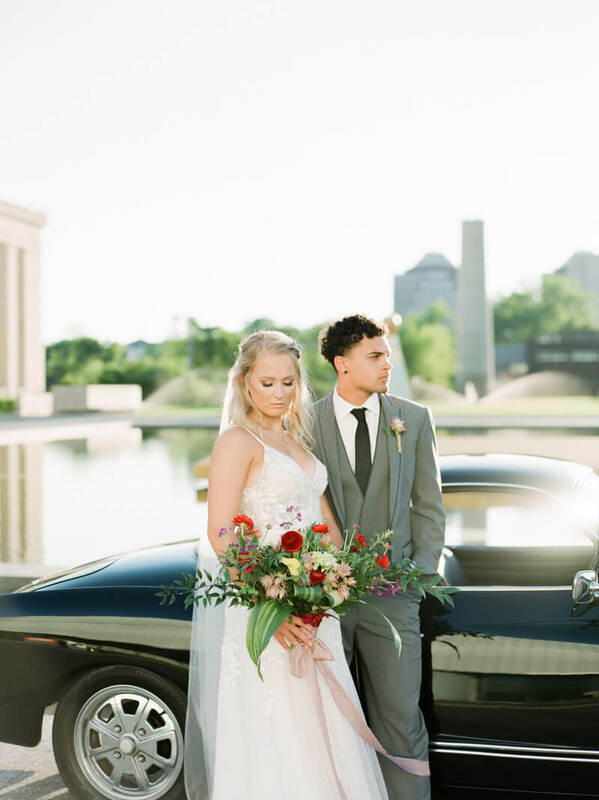 Outside of the Nelson-Atkins Museum of Art in downtown Kansas City, Missouri, this sweet bohemian styled summer shoot combines romance and bright pops of color fit for a warm wedding day. The radiant, youthful couple mix modern and classic styles to create a special look that is refreshing and perfect for this time of year. The invitation suite features a modern floral design outfitted with light pink, green and white hues. The blonde bride simply glows with her hair styled in curls and a side braid. Her perfect hairstyle is complete with the addition of an ultra-long veil. The floral inspiration offers a unique twist on summer blooms, coupling red, pink, yellow and purple flowers in a loose collection of interesting greenery. The arrangement is tied with blush silk ribbons. The bride and groom make a stunning pair. She dons an A-line silhouette with a floral-inspired bodice and thin straps. He looks handsome in a gray tuxedo complete with a slim black tie. Their appearance stands out amongst the grounds of the museum where the summer has produced lively greenery. Outside of a charming nearby building downtown, the bride and groom are enamored with one another. The bride also removes her veil to show off more of her unique bridal style and give her more freedom to move about. The museum’s grand set of steps creates a timeless backdrop. It also affords the bride a chance to display the back detail of her gown and a complete view of her veil. On the plaza near the reflecting pool awaits a gorgeous classic car. It’s the perfect homage to the bride and groom’s timeless and cool styles. The bride takes one last enduring glance as she sits on the hood of the car – a gorgeous moment captured in the heart of Kansas City. The Nelson-Atkins Museum of Art is an ideal place to capture this sweet summer-inspired styled shoot. It encompasses both classic and modern touches that speak to the style of the couple and yet, inspires anyone to seek the not-yet-discovered. If you’re straddling the line between timeless or contemporary styles, combine them both to create something wholly your own!